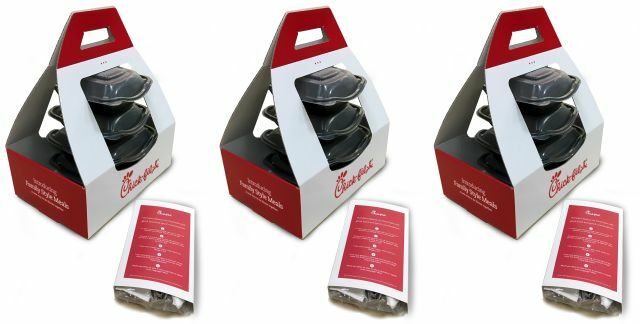 Hoping to offer customers a convenient takeout option, Chick-fil-A is testing new "Family Style Meals" in three cities: Greensboro, NC; Phoenix, AZ; and San Antonio, TX. The test also includes two new sides, including Mac & Cheese. Each Family Style Meal is meant to serve four people and includes one entree, two sides, and eight mini rolls. It also comes with plates, utensils, and condiments. Beverages can be added as well as additional entrees and sides. Entree options include: 12 Chick-n-Strips, four Original Chick-fil-A Chicken Breasts, 30 Chick-fil-A Nuggets, and four Grilled Chicken Breasts. Side options include new Bacon Baked Beans, new Mac & Cheese, a Fruit Cup, a Side Salad, and Superfood Side. New Bacon Baked Beans feature kettle-cooked beans, bacon, and brown sugar, while the chain's Mac & Cheese showcases a macaronis pasta with a blend of cheeses that include cheddar, Parmesan, and Romano. The Family Style Meal test is slated to run through November 18, 2017 with prices starting at $29.99 per meal.